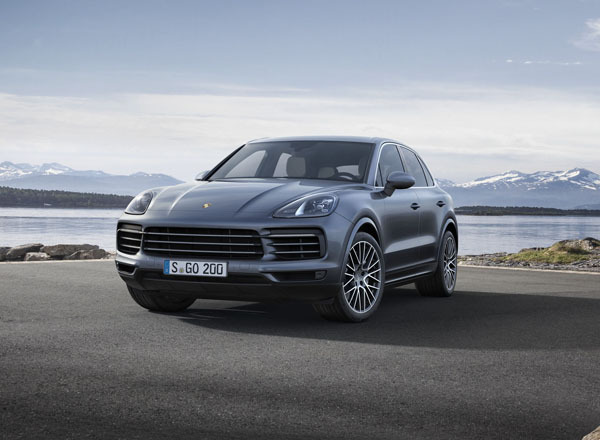 The third generation Porsche Cayenne was announced at a major special event in the German company’s home city of Stuttgart. Virtually an all-new design it offers increased performance not only due to improved engines, but also because clever engineering has reduced its weight. Following the 911 and the Panamera, the body of the Cayenne uses a combination of alloy and steel. The exterior is made entirely of aluminium. The floorpan assembly, front section and virtually all the chassis components are also manufactured from alloy. Fascinatingly, a lithium-ion polymer starter battery accounts for a weight saving of 10 kg over the predecessor. The appearance of the Cayenne is evolutionary rather than revolutionary, which is very much the hallmark of all Porsche design. “Don’t mess with the 911” has been a threat from purist owners for many decades and that now carries over to the hugely successful Cayenne range. The gen-three Cayenne is a touch lower than the outgoing model but has a wider look created by a distinctly horizontal grille and lights. There are larger air intakes at the front. It goes without saying that there are hints to the shape of the iconic 911 front and rear. In profile it’s sleek without being aggressively so in the manner of some coupe-like shapes of others in the high-performance SUV segment. Initially, two significantly revised six-cylinder engines will be available. The 3.0-litre unit turbo in the entry Cayenne develoes 250 kW, up 29 kW from the previous model. Then the Cayenne S with its 2.9-litre V6 biturbo engine produces 324 kW (+15 kW). Using the optional Sport Chrono Package, it accelerates from zero to 100 km/h in just 4.9 seconds – keep in mind this is a practical SUV with the ability to do semi-serious off-road work. This sort of performance isn’t just due to improved engines, the new eight-speed Tiptronic S gearbox plays a major part too. It has faster response times and sportier ratios in the lower gears and an expanded spread between comfort and sportiness. The overdrive high gears reduce fuel consumption and emissions as well as making touring more relaxing. In a sporting fashion the third edition of the Cayenne now has mixed tyre sizes and rear-axle steering for the first time. 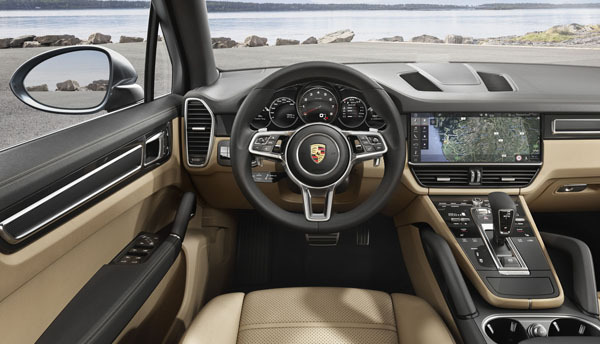 On-road capability is enhanced by active all-wheel drive, Porsche 4D Chassis Control, three-chamber air suspension and the Porsche Dynamic Chassis Control (PDCC) electronic roll stabilisation system. There is an active all-wheel drive system in all Cayenne models. The intelligent, fully variable Porsche Traction Management (PTM) distributes the driving force between the drive axles. 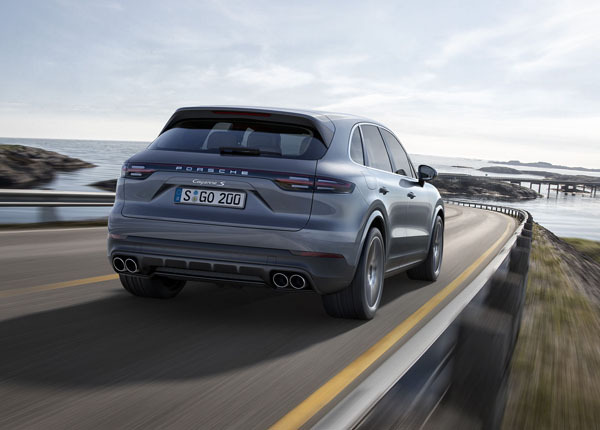 For the first time, the Cayenne is available with electric rear-axle steering as previously seen in the 911 and Panamera. The adaptive air suspension with new three-chamber technology significantly increases the spread between sporty and comfort. It also enables adjustments to the ground clearance on rough terrain. New Cayenne is always online if the driver wants it. The expanded Connect Plus services are available through the integrated LTE-enabled SIM card. Information contained in this press release supplied by Porsche Australia relates to European models only. Pricing and specification for the Cayenne and Cayenne S for Australia have not been finalised and therefore will not be announced until early in 2018. Australian deliveries will begin from mid 2018.